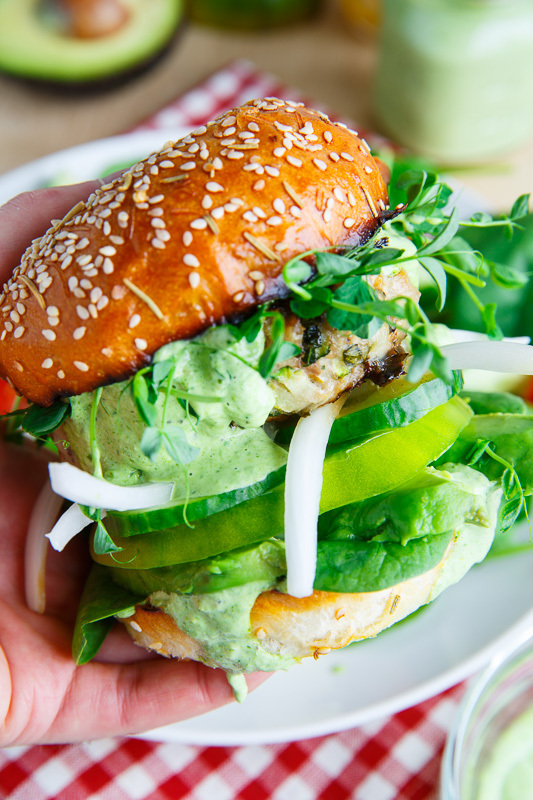 Juicy zucchini turkey burgers with green goddess mayo, avocados, melted mozzarella and ripe heirloom tomatoes that are just packed with flavour and scream summer! 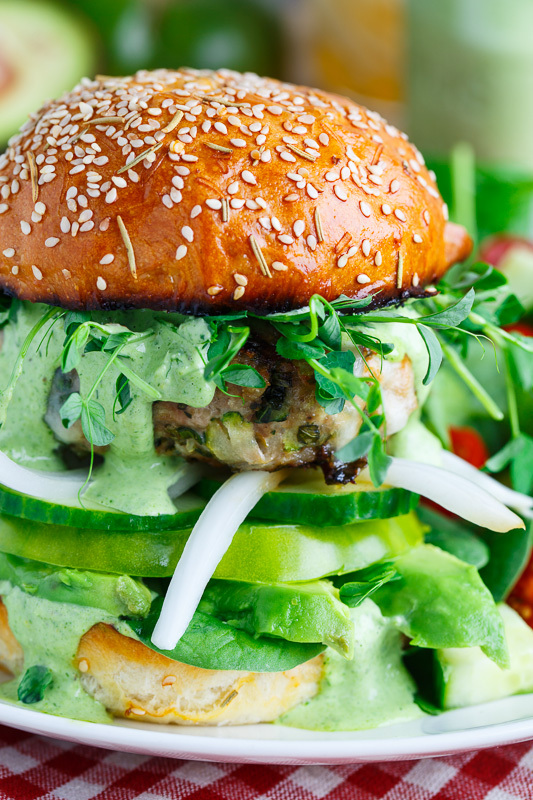 With the last long weekend of the summer here I have one more burger recipe for you, a green goddess zucchini turkey burger that is just packed full of summer flavour! 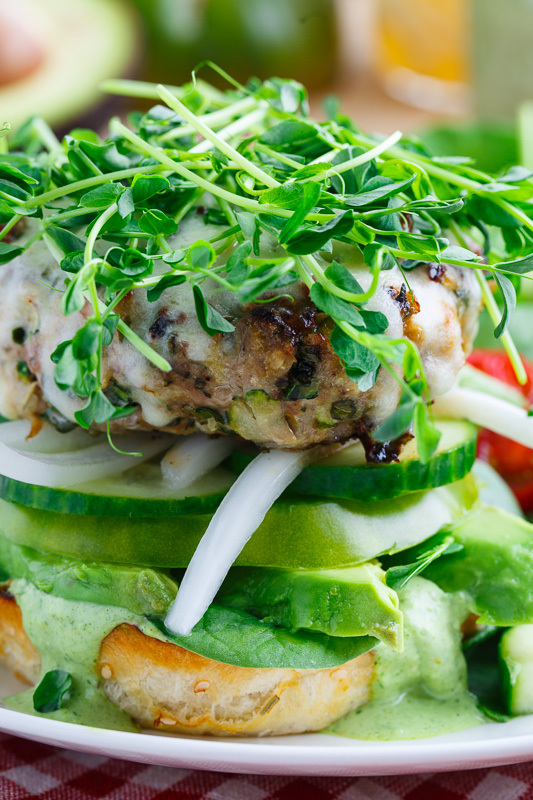 Normally turkey burgers can be a little dry but the addition of zucchini keeps them nice and moist and juicy so there’s no reason to shy away from these turkey burgers! The patties themselves are seasoned with green goddess style herbs including basil, tarragon and chives along with some anchovies, Worcestershire sauce and parmesan for tonnes of umami flavour! 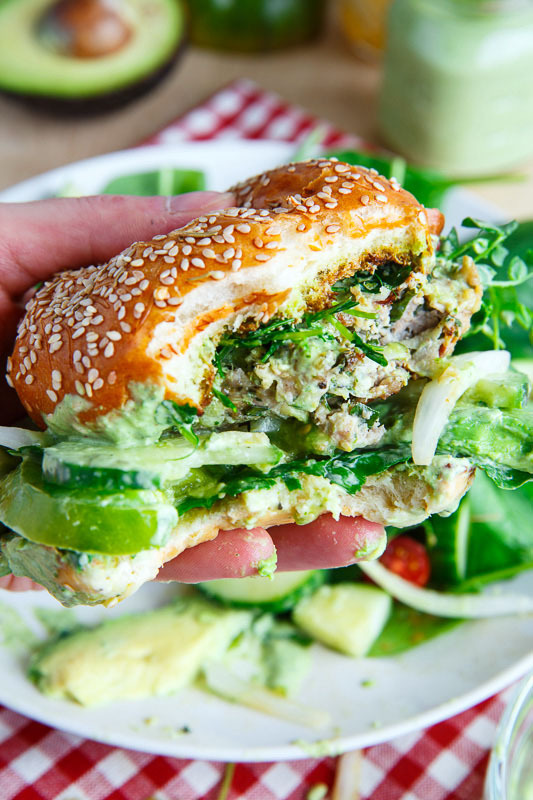 The rest of the burgers consists of ripe green heirloom tomatoes, avocado, cucumber, pickled onions, spinach sprouts, melted mozzarella and green goddess mayo! 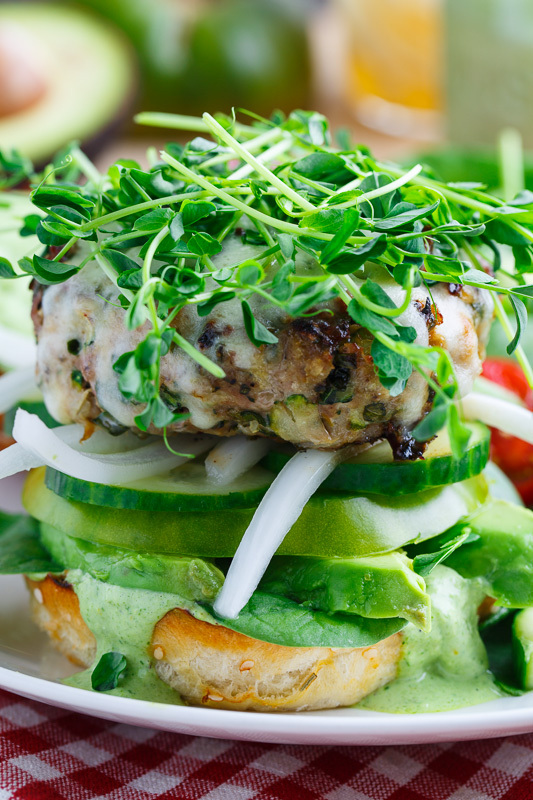 These green goddess zucchini turkey burgers are a great way to celebrate and enjoy summers bounty and they are the perfect burger for this long weekend! They are a mouthful of summers bounty! They are a bit messy but oh so good! Puree everything in a blender or a food processor. Mix everything and let sit for 10 minutes. Mix everything except the mozzarella, form 4 patties and grill until cooked, about 4-5 minutes per side before topping with the mozzarella and cooking until it starts to melt, about 2-3 minutes. What an amazing burger!! These flavors are so great!!! Just look at that burger!!! Love it all! Great for a Labor Day BBQ! What a beautiful burger! And can't believe all of those flavors in that turkey patty- must be incredible! I know what I'm asking for this Christmas…. I bigger mouth so I can BITE THAT THING. Bravo. 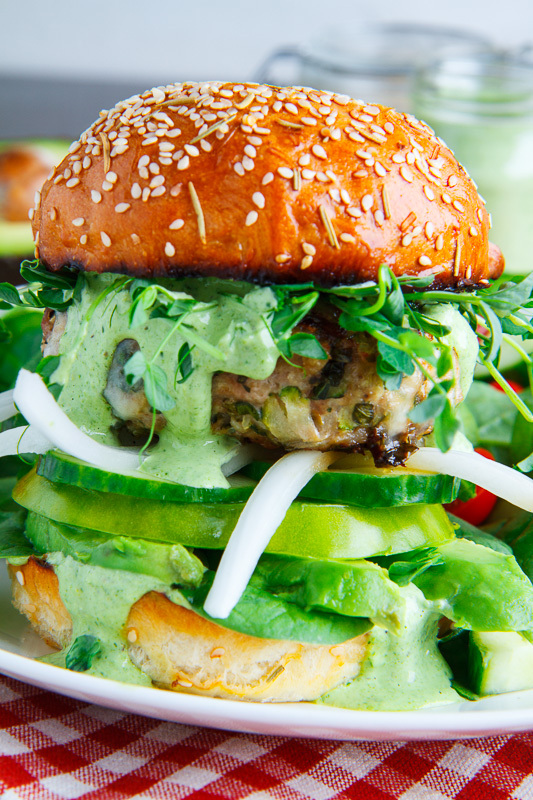 definitely the greenest burger I've ever seen! brilliant idea to add zucchini to prevent the burger from drying out! !